It is now possible to boost the light-to-power conversion efficiency of photovoltaics by nearly 80 percent by going 3-D.
With the creation of a 3-D nanocone-based solar cell platform, researchers overcome the problem of poor transport of charges generated by solar photons. These charges — negative electrons and positive holes — typically become trapped by defects in bulk materials and their interfaces and degrade performance. 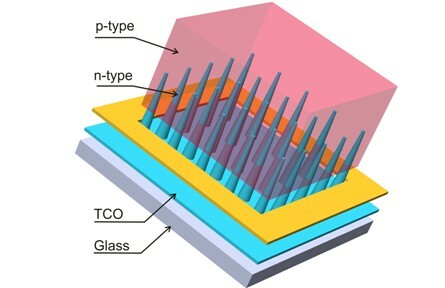 Nanocone-based solar cell consisting of n-type nanocones, p-type matrix, transparent conductive oxide and glass substrate. “To solve the entrapment problems that reduce solar cell efficiency, we created a nanocone-based solar cell, invented methods to synthesize these cells and demonstrated improved charge collection efficiency,” said Jun Xu, a member of Oak Ridge National Laboratory’s (ORNL) Chemical Sciences Division. The new solar structure consists of n-type nanocones surrounded by a p-type semiconductor. The n-type nanoncones consist of zinc oxide and serve as the junction framework and the electron conductor. The p-type matrix has polycrystalline cadmium telluride and serves as the primary photon absorber medium and hole conductor. With this approach at the laboratory scale, Xu and his team were able to obtain a light-to-power conversion efficiency of 3.2 percent compared to 1.8 percent efficiency of conventional planar structure of the same materials. “The important concept behind our invention is that the nanocone shape generates a high electric field in the vicinity of the tip junction, effectively separating, injecting and collecting minority carriers, resulting in a higher efficiency than that of a conventional planar cell made with the same materials,” Xu said.